It looks like Nokia is taking the competition seriously as they have evidently formed their own military, aptly called the Nokia Army. And what good is a military force if it doesn't have its own app, amirite? So it shouldn't be too surprising to find the official Nokia Army app sitting proudly in the Nokia Collection, awaiting your orders. Now some caveats: civilians are not welcomed for this app. You need to have proper ID to get in and that includes having a nokia.com, team-nokia.com, team-nokia.net, navteq.com or marketsource.com email address. Should you possess one of these, head to www.nokiaarmy.com and get yourself registered and enlisted. So what's the app for? Details are murky ("fog of war" stuff) but we can say that it's a "Nokia Tool for Nokia Army Team members to use when visiting and supporting retail in North America.". There should be little doubt folks, this is for Nokia's troops on the ground during Operation Rolling Thunder. 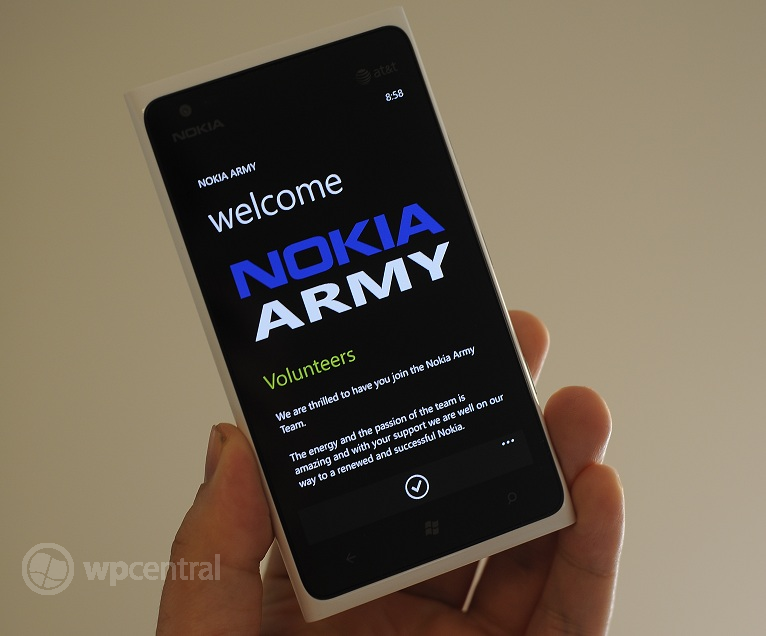 Download Nokia Army, should you qualify, here in the Windows Phone Marketplace. Over and out. Thanks, Jose, for the tip!